Super Natural Every Day, the second cookbook from 101 Cookbooks blogger Heidi Swanson, hit shelves in the UK today just weeks after earning a 2012 James Beard Award nomination. 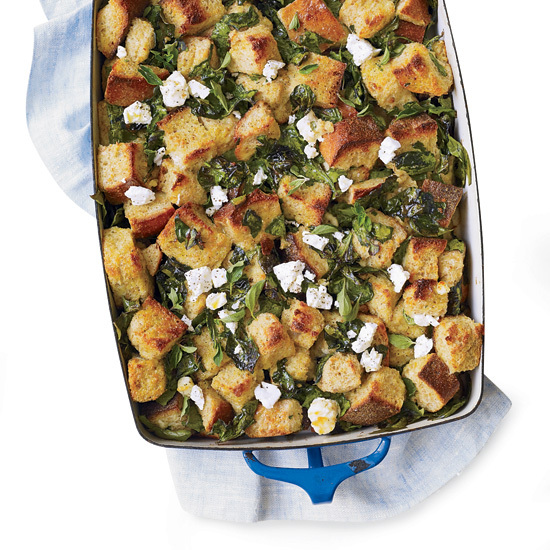 Measurement conversions aside, the exported version will include the original's fantastic recipes like this savory spinach-and-feta bread pudding, which was developed to use up day-old bread. (Stick to hearty artisan loaves as opposed to soggy sliced ones from the supermarket.) For spring, Swanson suggests subbing blanched slivers of asparagus or chopped broccoli in place of the spinach and trying goat cheese as a feta alternative. Toward the end of baking time, you can add a rustic quality by turning on the broiler “for a flash” to create a browned crust on top and pull out the dish whenever the eggs are cooked through. For additional flavor, Swanson likes to drizzle a bit of thinned out oregano-based pesto on top while it’s still warm.